Tribute forms give your donors the opportunity to honor a special person in a significant and impactful way. It gives attention to someone deserving of recognition, and it helps a nonprofit in the process. It’s a win-win for everyone. Donors are more inclined to donate if their contribution has the personalized touch of being made in honor or in memory of someone special to them. It shows them that you care about what’s important to them. It sets your nonprofit apart from others by reaching donors in a more personal way. Donors love being able to “tell the world” about someone special to them. Tribute forms are the way to do that. Sign into your Donorbox account and create a new donation form. If you already have a Donorbox account with an existing donation, you can simply edit this to include the tribute option. Go to the Custom Fields tab, as shown below. 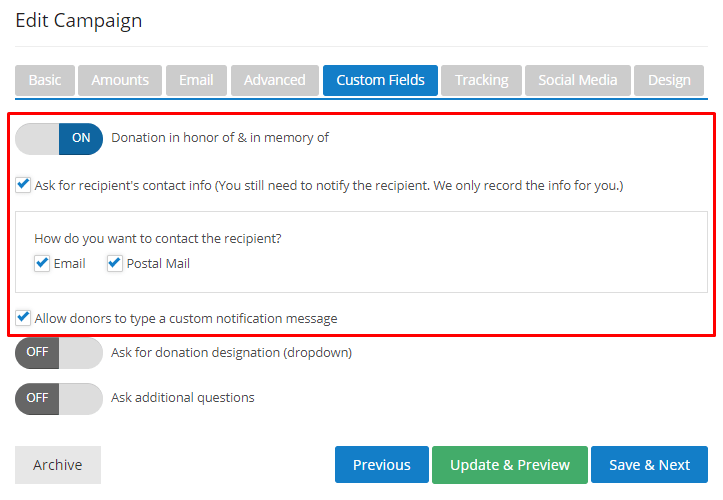 Enable the feature button labelled “Donation in honor of & in memory of”. Pick the type of contact info you want to gather for contacting the recipient or their representative. Hit “Save” when you’re done. 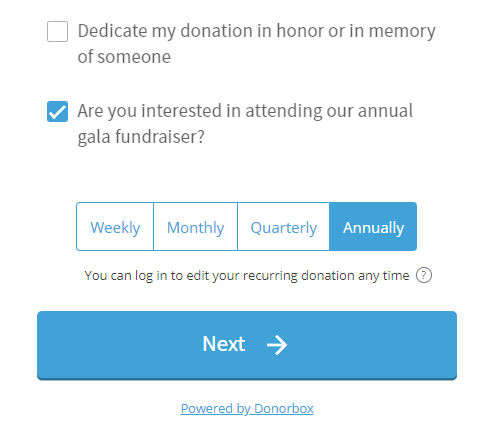 When a donor opts to dedicate their donation in honor of someone, the tribute form will ask for relevant info about the honoree, the person to notify and even a personalised message from the donor. Donors can also select a recurring donation to make their honorary donation a regular contribution. You can give your donors the option to specify their donation’s designation. If you set up more than one fund or activity that the donations are for, your donor can let you know which cause they’re donating to. Here’s how you can add designation options to your tribute form. You can gather as much information about your donor as you need. Names and email addresses are compulsory, but you can ask for other info too. Perhaps you need an address to send them a gift or printed material, or a phone number to keep them updated on your work. You could also ask custom questions to get relevant specialized feedback. There are a variety of recurring options for donors who want to give regularly. They can choose between weekly, monthly, quarterly and annually recurring options. 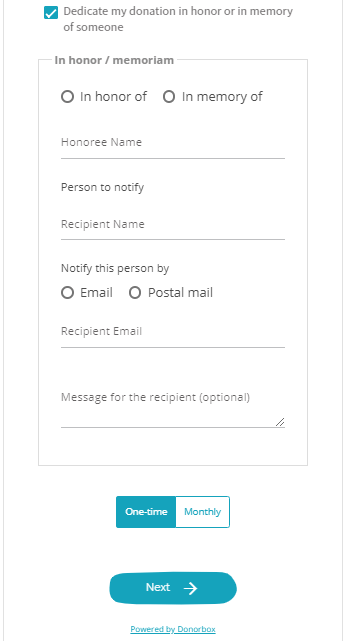 You can have a maximum of 4 interval options on your tribute form. 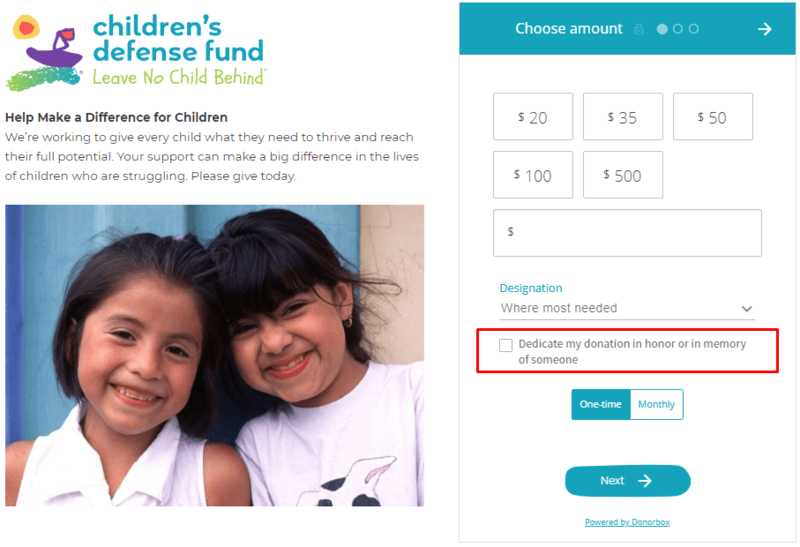 It’s also possible to make your form accept recurring donations exclusively, by disabling the one-time option as shown in the image above. Try creating a marketing campaign around the concept of paying tribute to others. This would work especially well for events or special holidays like Women’s Day or World Youth Day. You could also run a longer campaign for periods like Women’s History Month or National Cancer Prevention Month. 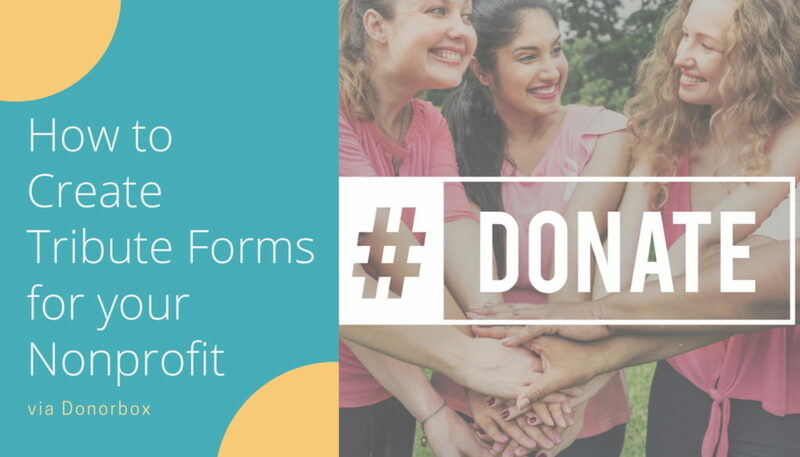 Tribute forms offer an extra meaningful dimension to regular donations. Donors respond positively because they are able to attach emotional energy to their donation. It’s a more fulfilling donation experience for them, and it means that your nonprofit can do more. So, give tribute forms a try! We will be publishing another blog post covering the best practices for tribute forms. Stay tuned for that which will be coming up very soon.